"Christmas, with its festivities and its preparations, was a busy time to the housekeeper of fifty years ago [1908 book], "befo' de war," [Civil War] in Virginia. It meant thought and labor for weeks beforehand; especially was this true of the homes in the country, where lavish entertainment was the rule. The home I have in mind is a rambling, old-fashioned Virginia house, thirty miles from Fredericksburg, and in that part of Virginia known as the Northern neck, which is said to have produced more great men than any other place of the same size in this country. Two weeks before Christmas began the busy time, seeding raisins, cutting citron, washing and drying currants, for these were the days before all this could be bought. Every housekeeper had her own especial receipts handed down from mother to daughter. 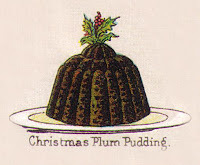 In the big kitchen at night, before a blazing log fire, would sit the cook, surrounded by several of the house servants preparing the fruit for cakes, mincemeat and plum pudding. Apple toddy was made by an old family receipt usually a month beforehand, as it improved, like many other things, with age. The menu for a Christmas dinner at this old house was a soup, either calf's head or turtle; then a turkey at one end and a young pig or a haunch of venison at the other, with a great variety of vegetables. Wines of different kinds were served throughout the dinner, and of a rare vintage were they, for every man of means had his wine cellar and the Virginia gentleman of those days was a connoisseur. 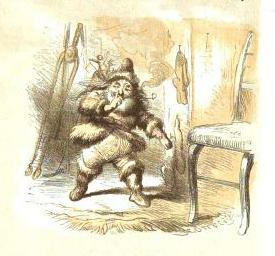 Then came the dessert, to childhood's eyes most important; a bowl of calves foot jelly, sparkling in the cut glass bowl, and the oft repeated comparison of Santa Claus in the old nursery jingle [The Night before Christmas, first appeared 1823, image from 1862], "that he had a round face and a little round belly, which shook when he laughed like a bowl full of jelly," was a good one to juvenile minds. 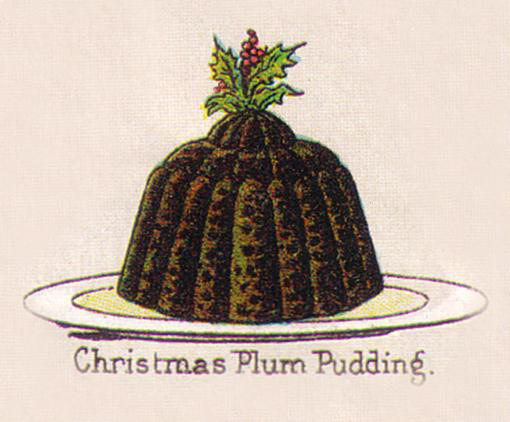 The plum pudding was always brought in, in a blaze of glory, with a sprig of holly in the top, while the blue flame danced around it. A big fruit cake, mince pies and blanc-mange moulded in the shape of eggs and lying in a nest of thinly shaved lemon peel, were some of the Christmas cheer on that dinner table."